This exclusive Retinol formula is encapsulated with an antioxidant complex, enhancing skin texture and minimizing irritation. This 0.25% Retinol treatment is appropriate for all skin types and first time Retinol users. Apply a single pump to face in the evening. If you have never used a Retinol product before, begin by limiting use to twice a week, gradually increasing frequency to every other night, and then advancing to each evening or as tolerated. Mild redness, peeling and irritation is expected when using this product. Use daily sun protection with SPF 20 or higher during use of this product. Avoid getting in eyes. If contact occurs, rinse eyes thoroughly with water. I live in the desert - I had to do some thing fast. Spent hours reading reviews. Decided to buy. Instantly felt tightening . After 3 weeks I swear my age spots are disappearing. My husband says my skin glows. 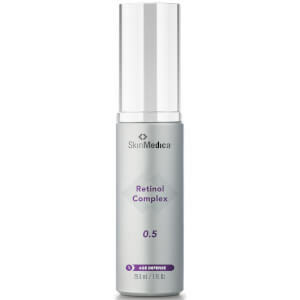 I am also using THS recovery complex by skinmedica . These 2 together seem to have made a world of difference in my skin. It really glows. I have sensitive skin and worried about the combo but after a little bit of peeling and doing it every 3 days with the Retinol and the TNS stuff every day and night - my skin looks like in my 30's . Super happy. I follow up everything with Neutrogena oil free moisturizer.